Michael Doohan, a 26-year-old Australian, is the rising star of 500cc Grand Prix racing and, with third place in the 1990 championship, he represents Honda's best chance of regaining the title. 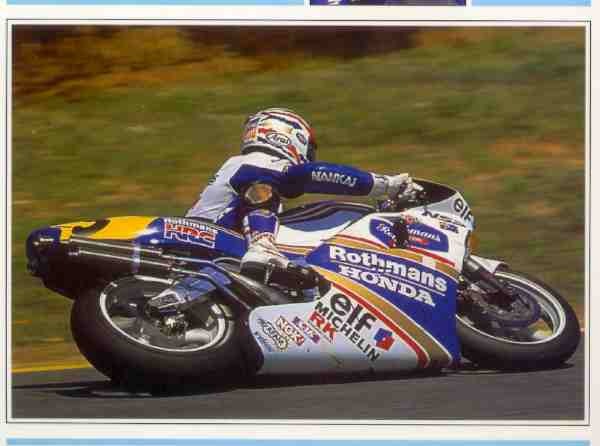 Doohan is a specialist in power slides, a method of taking bikes through curves. This technique was developed by the Americans and introduced to Grand Prix riding by Kenny Roberts at the end of the Seventies. It involved revising the layout of the bikes, with the engine moved forward in the frame to shift the center of gravity forward, improving handling in the slides. Though all the 500cc Grand Prix engines are currently V4 two-strokes, Honda is the only maker to retain a single-crankshaft layout. Atmospheric intake valves are used, while electronically-controlled valves enable the exhaust timing to be altered. The Honda engine has proved the most powerful of the current GP engines, but it can also overwhelm a bike that can't take the stress. The cycle's components have undergone many modifications in the quest for a stiffer bike, with inverted front forks and banana shaped rear swinging suspension arms. The crooked aluminum box-girder arms pass beneath the exhaust pipes, improving the ground clearance when cornering.